House of Ladders offers a wide range of ladder accessories for both aluminum and fiberglass ladders. 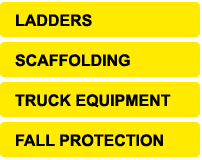 For a complete list of ladders, ladder accessories and ladder supplies please browse our online product catalog below. Can't find what you are looking for? Give us a call at (800) 334-6909. House of Ladders has multiple locations and distribution warehouses throughout the United States which allows us to provide our customers quick delivery and shipping from the warehouses and even customer pick-up. You can browse our extensive line of ladders and ladder accessories utilizing the category links below. Please use our convenient product filter search to sort your ladder supplies by material, load capacity and style. Looking for more than ladders? Click here to view the categories of products we have available for you. We carry a wide variety of items and if you don't see what you are looking for, we can gladly locate it for you. Our trained professionals and knowledgeable sales force are available to answer any questions and can be reached at (800) 334-6909. We are committed to offering our customers the highest quality equipment available at the best price. Metaltech designed this 12.5 foot ladder to be simple and easy to use. With a locking system that adjust every 1'(from 32" to 12.5'). The telescopic ladder is a sensible alternative to the traditional bulky extension ladder. Ideal ladder when you don't want the hassle of lugging around a heavy extension ladder. Would you like to place an order? Call (800) 334-6909 or click here.